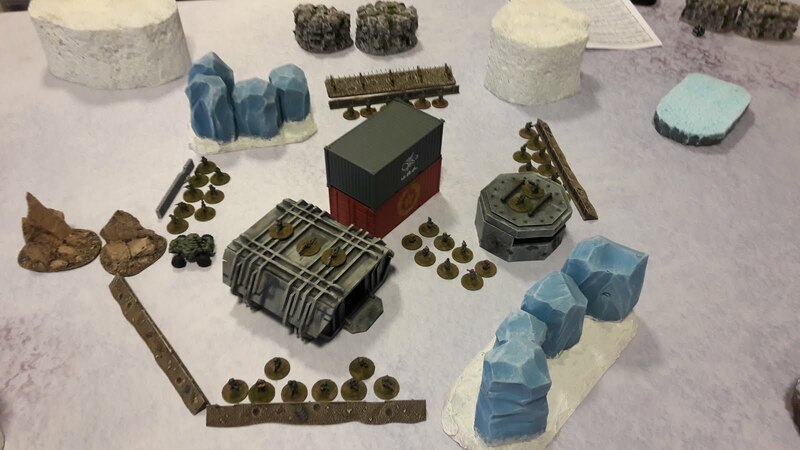 On the icy moon of Kroeb in the Ariadne system the Varuna Legion has been contracted to defend some important property of Onyx Pro Ltd before its being shipped. This has definitely not been part of a cover up to perform an Invasion with “little green men” somewhere in this system. At 0730 hours SET the outer sensors detect troop movement east-north east of the base and acting PC Sgt Bob Sergeant of the Varuna Rifle infantry chokes on his coffee when the energy signature does not match the Sickles! 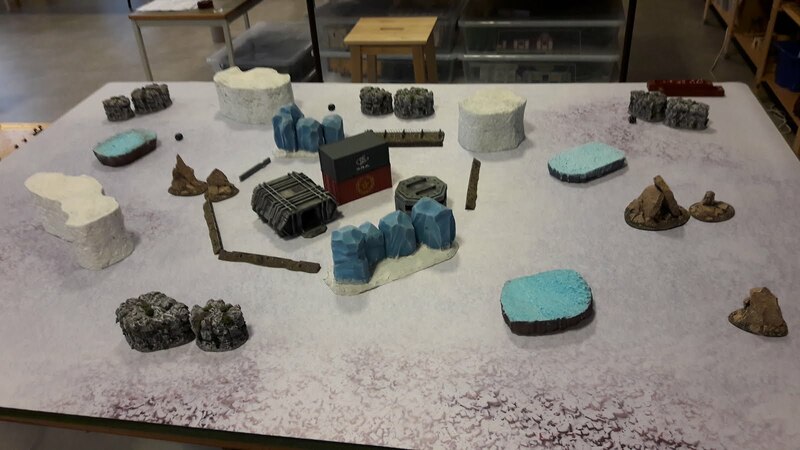 With this we welcome Aurelio to the campaign with his Franco-Spanish PMC, the Mireesh War Company, making its debut as attacking force in the Hostile takeover scenario! 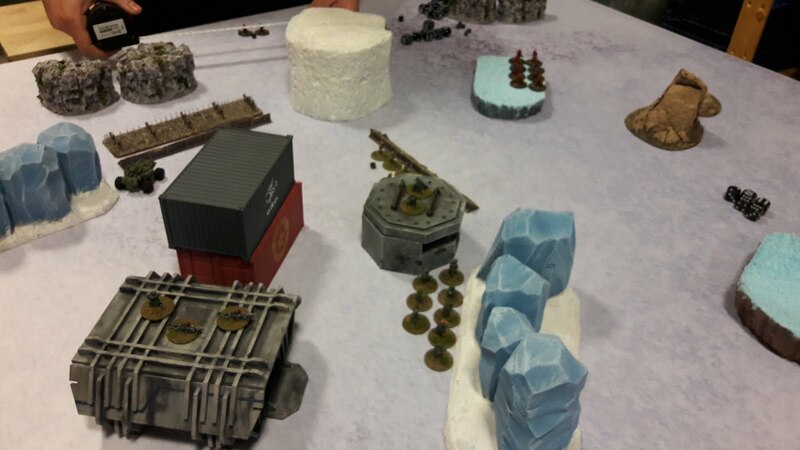 The battle field with the very important containers belonging to Onyx Pro Ltd. The Varuna forces deployed for battle. North is to the left in this picture. 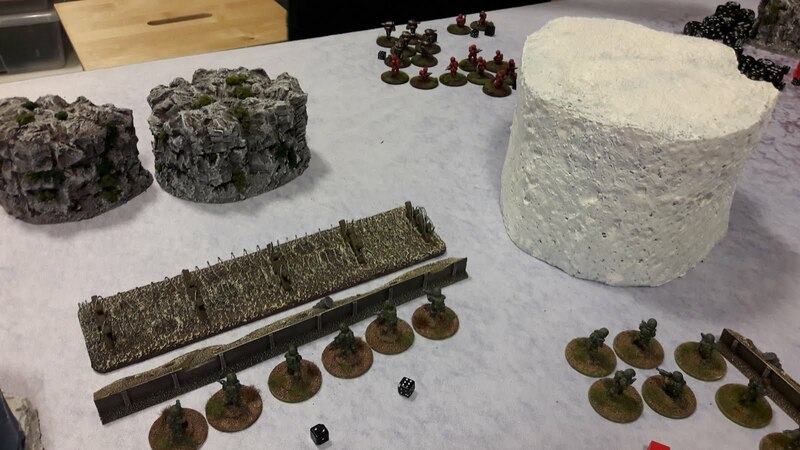 The forward elements of Mireesh deploys aggressively on the eastern border of the combat zone, an LMG team, some recruits and a mortar section. The LMG team immediately lights up the eastern most recruits and break them beyond repair! A Varuna unit, the 16th Militia, return fire causing a few suppression points, and they are then in turn pinned by the Mireesh recruits. 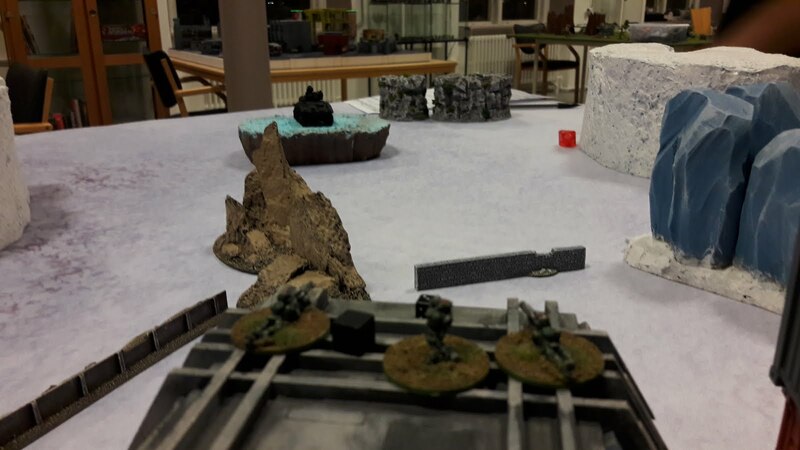 The Legion now brings out its big guns and the LMG team is broken by the might of the M5s 22mm Autocannon and the recruits pinned by Varuna Mortar fire from a nearby bunker. They are hammering us from the hill! The Mireesh have temporarily been beaten back but just then they receive reinforcements! A Field command 3rd grade and a rookie rifle team enters from the east and in the north a Heavy patrol vehicle enters! The Varuna Rookie rifle team that has been rushed to reinforce the eastern flank is caught in the open by the Heavy patrol vehicle and decimated, Sgt Sergeant will never see the family farm back on Varuna 4 again. Parts of the reinforcements are broken and beaten back but the Mireesh manages to regroup and mount an attack from the south threatening to break the Varuna defensive perimeter using the might of a hill! The Varunians are now boxed in but the Mireesh are taking heavy casualties – who will break first? 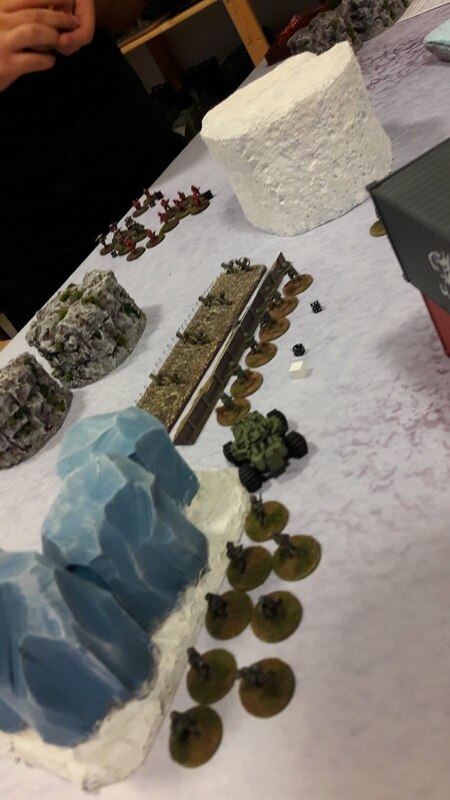 Just as the Varunians on the southern flanks are wavering the LMG section in the northern bunker hits home and disables the Heavy patrol vehicle, the Mireesh are now too few to mount a final assault and are routed! The very important cargo of Onyx Pro Ltd can now safely be shipped! AP-rounds loaded, light ’em up! 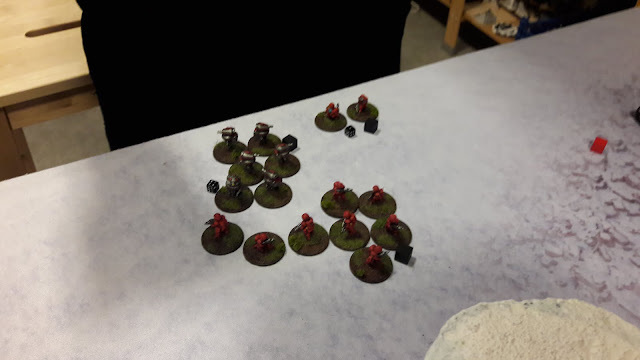 In the post-game sequence, the 16th Militia gained a new level, Into the shadows, giving them Stealth!